I think just about everyone has an Instant Pot by now, right? If you’re one of the handful who don’t and aren’t familiar with Instant Pots, they are electric pressure cookers with a slew of other functions. My favorite use? Eggs. I know that seems basic, but once I started making hard cooked eggs in my Instant Pot, I never went back to boiling. What really blew my mind was making poached eggs in my Instant Pot, which is what I’m going to chat about today. I’ve also got an amazing Southwest Eggs Benedict recipe for you, so stick around for a few minutes. To poach eggs in an Instant Pot, you’ll need some silicone poaching cups. I found some inexpensive ones on Amazon. And I’m willing to bet everyone has a glass measuring cup. You’ll need that, too. It’s easier to place the poaching cups on the wire rack and then pour the egg into the cups using a glass measuring cup. Cracking the egg into the measure cup first also allows you to check for broken shells and to make sure the yolk isn’t broken. You can fit up to five silicone poaching cups in there, but that fifth one is a tight fit and might produce some wonky looking poached eggs. If you’d like them to look uniform, then just use four. You could also just do one if you’re having a solo brunch. Set the Instant Pot on manual (I use the “manual” or “pressure cook” button) for 3 minutes. This is super important: Once the pressure-cooking time has ended, IMMEDIATELY switch the steam valve to venting and get all that steam out. You’ll want to get those eggs out as quickly as you can because if you leave them in there with all that steam for just a minute longer, you’ll overcook the yolks. Once you get the cups out, you can remove the eggs by running a big spoon along the bottom and lifting it out—kind of like scooping an avocado half out of its skin. See? It comes right out. I turn mine upside down on a paper towel-lined plate to soak up any extra moisture. Sometimes a little water will accumulate on top of the eggs from the Instant Pot. This particular yolk was at the bottom of the poaching cup so it nearly leaked out when I was taking it out of the cup. Most of the time it won’t be like this. But even so, the yolk stays in the egg pretty well. I also topped it with an avocado slice and a drizzle of chipotle-lime Hollandaise sauce. I added a pinch of dried chipotle powder to make it more pretty. And delicious. If you eat a gluten-free or low carb/paleo diet you can use roasted sweet potato slices in place of the English muffin. I actually preferred that way and loved the bit of sweetness from the potatoes. Seriously, if batch cooking poached eggs doesn’t convince you to buy an Instant Pot, I’m not sure what will. It makes such a fun, little brunch option! And since the eggs cook so quickly, it’s easy to make multiple batches for a small crowd. So you’ve got a beautiful basil plant with leaves ripe for the picking. After you’ve picked the cream of the crop, you’re faced with the arduous task of pulling the leaves apart by hand, smashing them with a kitchen knife, or slicing them with typical kitchen scissors. With multipurpose, stainless steel herb scissors from Chefast™, you can do those prime herbs justice and keep them as fresh as possible for your hungry guests. Just a few quick snips, and you’ll create the ultimate herb infusion or refreshingly delicious garnish. No need to pound away with a knife and leave most of the flavor on the cutting board. More Than a Kitchen Gadget: While we created these shears to help in the kitchen, they’re also fantastic as arts and crafts tools. Cutting heavy-duty paper or strips of fabric has never been easier. Comfort Counts: What good are the most effective herb scissors if they mangle your hands every time you use them? With our premier TPR grip, you can cut in comfort every time without worrying about slippage. All In: With a cleaning comb and protective cover, plus two drawstring herb bags, this sleek, attractive package contains everything you’ll need to make the most of your cool new kitchen tool. Give The Gift Of A Clean Cut: We took care to put all this together in a stylish box that anyone would be thrilled to receive. Whether it’s a shower, housewarming, wedding or annual gift grab, this shear set makes a fun gift that’s actually useful! Got You Covered: With our 100% lifetime warranty, we guarantee that these scissors will perform their best for years to come. If anything ever goes wrong, we’re right here with a free replacement. ***100% CUSTOMER SATISFACTION GUARANTEE*** At Chefast, we truly care about making our customers happy. In addition to the standard 30-day refund guarantee that most sellers offer, we back up our herb scissors with a LIFETIME replacement warranty. If for any reason you are not completely satisfied with your purchase, a full refund or a brand-new pair is just a few clicks away. ***YOUR PERFECT HERB SCISSORS SET*** Looking for the best combination of performance and value? This unique set offers you 5-blade herb shears, two drawstring herb bags, and safety cover with a cleaning comb. When you create your next meal with the help of this herb mincer, you’ll remember why you grew herbs and vegetables in your garden in the first place. ***PREMIUM MATERIALS ONLY*** With quality stainless steel construction, five 3-inch blades and an ergonomic TPR handle that won’t slip, you’re in complete control, whether you’re serving up a small feast or helping the kids with their latest masterpiece. That’s because these multi blade scissors work wonders in the kitchen as well as the art room. ***CLEANUP IS A BREEZE*** We built a cleaning comb right into the safety cover. Just give the blades a quick swipe and those clingy herbs fall off with minimum mess. Still some lingering residue? A quick rinse is all it takes to get the blades clean and ready for the next task. ***WONDERFUL GIFT FOR MANY OCCASIONS*** Our premium herb scissors set comes in a stylish box that makes it a great choice for a wedding gift, Christmas gift, housewarming gift or any other kind of gift. Maximize the freshness; order a pair or two of these multipurpose herb scissors today! Spring is here and so is the spring holiday Novruz! A lot of holiday baking has been done by Azerbaijanis around the world to celebrate the arrival of spring on March 21st. 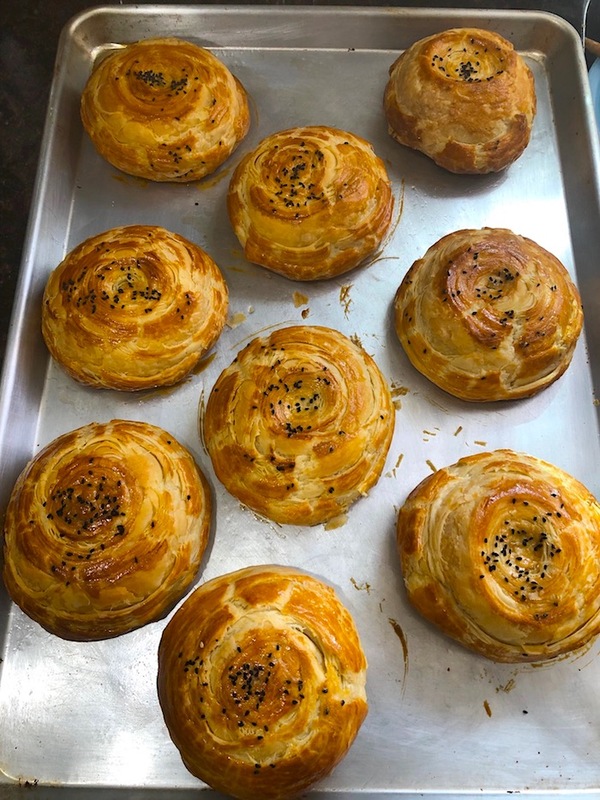 Along with scrumptious multi-layered pakhlava (baklava) and tender nut-filled shekerbura, spice-stuffed savory breads called shorgoghal are among the bakes to adorn generous festive tables every year. The following is the updated version of the recipe I first published on the blog on March 17, 2011, then in my cookbook Pomegranates and Saffron. I have been improving the recipe ever since, hence the update, so that from now on you can make better shorgoghal each and every time. Don’t wait for Novruz to make these tasty breads. They are good all year long! Serve with black tea (some prefer sweetened black tea to go with shorgoghal). A good shorgoghal is supposed to be crispy and flaky around the edges, slightly tender on the inside, with visible multiple layers all around. Enjoy and Happy Novruz! The post Shorgoghal, or Spice-Filled Flaky Breads appeared first on AZ Cookbook. Roasted red peppers are my favorite pantry item; well, they’re up there alongside jars of good marinara sauce. You can turn a jar or two of roasted red peppers into so many different recipes, from soups to sauces to panini to dips. The flavor is mild and slightly sweet, and I’m always amazed at how much I love them. This soup boasts two whole jars of the beauties, and it’s perfect for lunch or dinner. Plus, it’s purty. You’ll love it! And stir, cooking the onions and garlic for about 3 minutes. And 2 jars of roasted red peppers that have been sliced. Look at those little blackened bits. Flavah! Stir and cook the potatoes and red bell peppers for about 3 more minutes. And stir to combine, letting it cook for a couple of minutes. Sprinkle in the salt and pepper and turn up the heat to medium-high. Pour in the white wine, then stir and let it start to cook. Then pour in some vegetable or chicken stock! Bring the mixture to a gentle boil, then reduce the heat to medium-low and simmer until the potatoes are very tender, about 18-20 minutes. Now it’s time to puree the soup, which releases all the amazing flavor of the peppers and makes the potatoes just become a part of the mix. Keep going until it gets to the texture you like. This is the texture I like! Now it just needs cream. I add about a half a cup, or up to 5 gallons. Just kidding about the 5 gallon part, but my point is that if you wanna add more cream, you should live the life you were born to live and just add it. And truth be told, I probably added 3/4 cup of cream. Stir it to combine and let the cream warm up for a couple of minutes. Finally, add a little red wine vinegar and cook for another minutes. Done! Serve with a little grated Parmesan and some fresh oregano leaves. Enjoy, friends! It’s still cool in some areas, so this soup is just perfect for the weather. Key lime pie is an easy dessert to love. Not only is it delicious, with its combination of zesty key lime juice and rich sweetened condensed milk, but it is very easy to make at home. I make it on a regular basis and I’ve even added other flavors to the basic recipe. 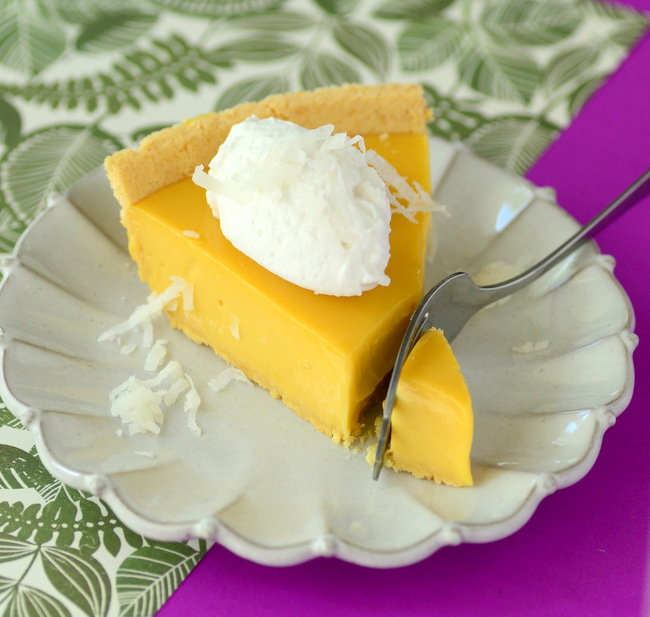 This time around, I used the idea of a key lime pie and swapped out all of the lime juice for a more tropical favorite to make Passion Fruit Pie. This pie uses passion fruit juice in the type of recipe that would normally be made with fresh key limes. The pie filling is made with sweetened condensed milk, egg yolks and a generous amount of fresh passion fruit juice. Passion fruit works in this recipe because the fresh juice is very acidic, just like key lime juice, so it reacts with the other filling ingredients and begins to thicken even before it goes into the oven. Passion fruit juice is incredibly aromatic, with an amazingly sweet floral scent that you’ll notice as soon as you cut into the the fruit. This tropical aroma carries over into the finished pie, so you get a bright tropical flavor – complimented by the creamy sweetness of the sweetened condensed milk. If you like key lime pie, you’ll probably fall in love with this at first bite! Like key lime pie, it’s important that you use fresh juice to make this pie. It can take a bit of effort to juice fresh passion fruits, but you can follow my tutorial here. Passion fruits can usually be found in well-stocked supermarkets. You can also sometimes find fresh passion fruit juice in specialty markets, but be sure that you’re not buying a product with sweeteners added (or any other juices in the mix) if you try a packaged juice. The pie can be baked in a shortbread crust or a graham cracker crust and should be refrigerated before serving. The pie is best within a day or two of baking. I topped this pie with coconut whipped cream to serve it. The whipped cream is lightly sweetened whipped cream with finely chopped shredded coconut added to it. You can also make non-dairy whipped cream with coconut cream and get similar results. Both will yield a delicious topping for this dessert. In a large bowl, whisk together passion fruit juice, sweetened condensed milk and egg yolks until smooth. Pour into prepared pie crust and place on a baking sheet. Bake for 15-20 minutes, or until pie filling is just set. Remove from oven and cool to room temperature, then refrigerate for at least 4 hours until well-chilled. Top with coconut whipped cream, if desired. In a medium bowl, beat heavy cream to soft peaks. Beat in confectioners’ sugar, vanilla and rum. Fold in shredded coconut. The post Passion Fruit Pie with Coconut Whipped Cream appeared first on Baking Bites. The Danby DBC120BLS 3.3 cubic feet beverage Center is the perfect teammate with those big sporting events. When friends and family stop by it’s always good to be prepared to serve up some cold beverages while watching a game or just enjoying the company. No matter what event keeps those guests ever-present, this beverage center will be a great asset. With a 120 can storage capacity you will be sure to never be short on ice cold beverages. The tempered glass door and stainless steel trim add an elegant touch to any decor. Package Content: 3.3 cubic feet beverage center, manual, tempered glass door with stainless steel trim. Recessed side mount door handle. Integrated lock with key. Interior light illuminates compartment. Color – Black with Stainless Steel. Height 33.70, Width 17.87, Depth 19.75, Weight 68.90. Color – Black/Stainless. Manual Language: English, Spanish, French. Assembly Required. “There is no beating grief. There is no getting over it. Yet, the beauty of grief is that it stretches your emotional bandwidth. Joy, happiness, love, compassion: The degree to which you can feel them is directly proportional to the amount of pain, grief, sadness, and devastation you have felt.” This is a quote from Beautiful Grief, a book I read recently. It came into my life at a time when I was experiencing more than my fair share of grief. I’m trying to focus on this idea of letting my grief expand my capacity for joy. Baking is where I often find joy. One of the reasons I am grieving is the loss of my dear friend Susan Russo. I met her in the early days of blogging. She was a terrific writer and recipe developer but mostly just a wonderful person. 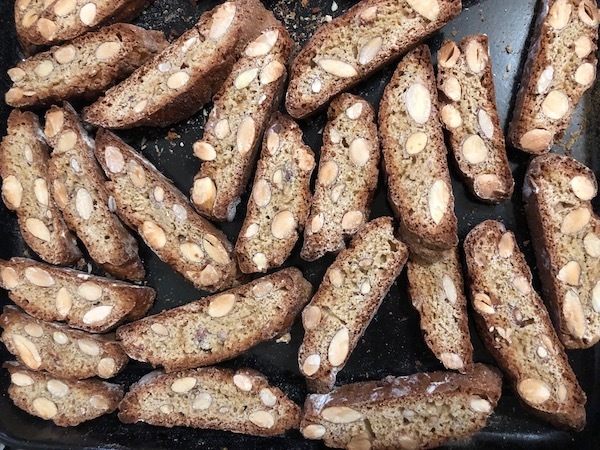 I am trying to hold on to my happy memories of her and celebrate her with one of her recipes, Traditional Italian Almond Biscotti. The cookies are chock full of toasted almonds, scented with vanilla and orange. The recipe makes a big batch, so there are plenty to keep and to share. 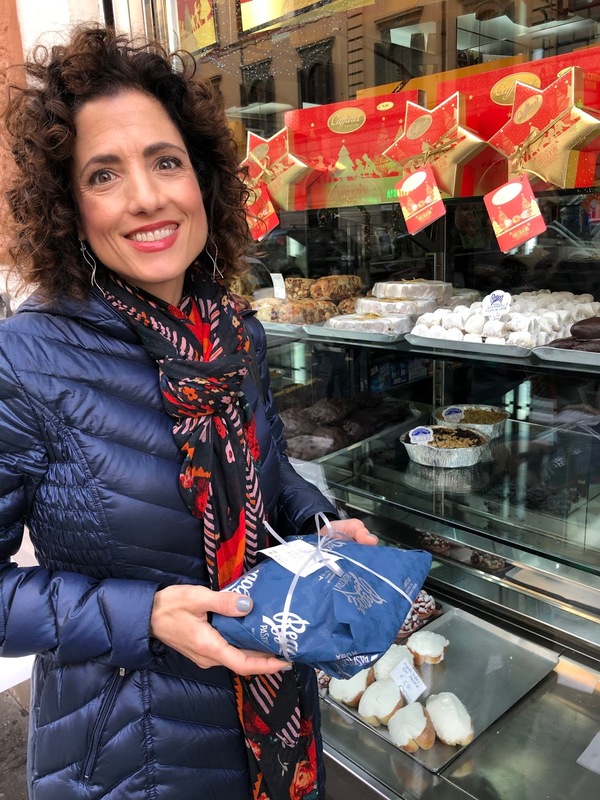 I associate many recipes with Susan—Italian American dishes of course, and ingredients like fennel and olives. 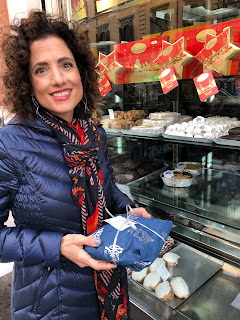 Her two blog posts, one on Kitchen Window and another on her blog about biscotti capture so much of what I loved about her—the way she shared her heritage, humor, and warmth, all while caring for others. I hope these cookies bring you, and anyone you share them with, some joy. The recipe is from Susan Russo’s mother, I’ve adapted the instructions. Preheat oven to 350 degrees F. Line two rimmed sheet pans with parchment paper. Place almonds in a single layer on a baking sheet and toast in the oven for 10 minutes. Remove and let cool. In a large bowl, stir together the toasted almonds, sugars, cinnamon, baking powder, and flour. In a small mixing bowl, combine 3 jumbo eggs, vanilla and orange zest and whisk until well blended. Add the wet ingredients to the flour mixture. Work the batter together with lightly floured hands. The mixture will be very sticky. Squeeze the dough and once it comes together, form a ball. Divide the ball into four equal pieces. On a lightly floured surface place one piece of dough, and roll into a log approximately 8 inches long, 2 inches wide, and 3/4 of an inch high. Repeat with the remaining three pieces of dough. Place two logs on each baking sheet. Brush the tops of the dough with the beaten egg. Bake for 35-40 minutes, or until the tops of the loaves are shiny and deep golden brown. Remove from the oven and transfer to a rack for about 20 minutes before slicing. Place a loaf on a cutting board, and using a large serrated knife, slice cookies 3/4 of an inch thick on the diagonal. If the slices crumble, then let cool a few more minutes before slicing. Place slices on their sides back on to the baking sheets; place in the still warm oven with the temperature off and the door closed for 30-60 minutes. The longer they stay in the oven,the harder they will become. Remove from oven and cool completely before storing up to one month in a tin or another air tight container. Update Your Cooking Routine With The Ultimate Kitchen Utensil Set By SVEETLIFE! Would you like to equip your kitchen with the most practical and useful accessories? Meet The Complete,Sveetlife 8-Piece Kitchen Gadgets set & Enjoy Cooking Like Never Before! Designed to make your life easier! Can Opener : size:21.5*6.4*4.5cm.This heavy duty can opener with sturdy shape for easy turning that allows you to cut everything safely without creating sharp edges. Grater: Size:25.3*5.9*1.8cm. Perfect for fresh home cooking use. Grate cheese and vegetables for salad, pasta or pizza toppings. Shave fruit and chocolate to decorate cakes. Robust construction with durable, razor sharp teeth for high performance and quick results. Peeler : size:20.2*3.2*1.8cm. To peel your fruits, veggies and potatoes in seconds. Egg beater :size:26*5.5*5.5cm. Our whisk is a good assistant for whisking eggs, icing sugar mixture and melted chocolate fresh cream. makes cooking easier and more fun. The stainless steel ends allow for easy hanging on any hook in your kitchen, allowing for easy storage. A must-have for home cooks and restaurant chefs. Pizza Cutter:size:22.2*7.1*2cm. Slice pizza like a pro,this pizza cutter will leave you shocked with how easy it is to get a nice, clean cut through your pizza!The sharp blade ensures you get a one time clean slice and will keep the toppings on your pizza. It easily cuts through both thick and thin crust, and can also be used to cut brownies, fudge, cookies and much more! Tea strainer:Size:24.5*7.2*5.2cm.A handy mesh infuser to scoop and steep tea with ease.A convenient infuser to give you the perfect tea brew without a teapot,the strainer is easy to use and practical.